This summer we had our backyard cleaned and have someone built two raised bed for my vegetable garden. I had been composting all the waste from juicing into the soil I had the last few months, when I transferred the soil into my brand new raised bed I also added a couple of bags of organic soil. The results of good soil are really clear to see, my tomato plants are bearing fruits galore and we already harvest couple of cucumbers and peppers before mid of June, real early considering where we are. My pepper plants really thrive well, it flowers a lot and bearing fruits already, its leaves are healthy and huge! I mean, really huge, as big as the size of my palm! 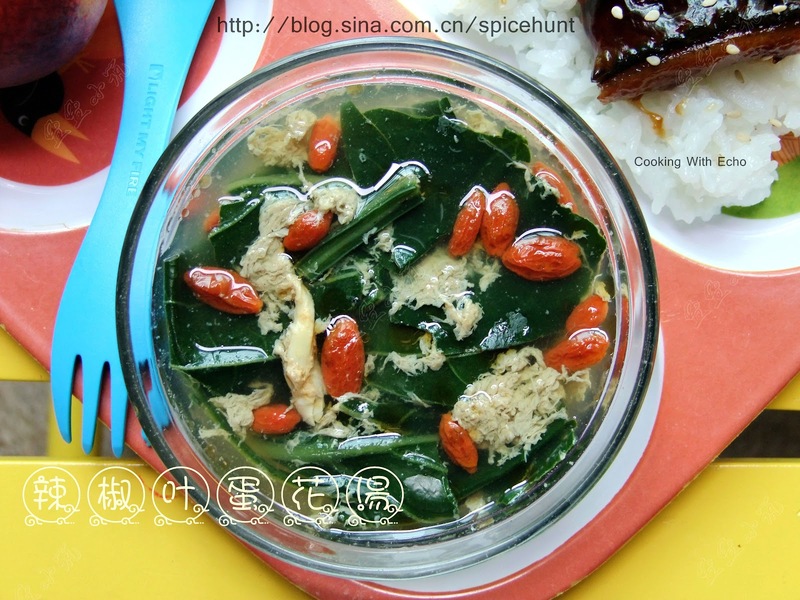 Chili leave is also a very good green to add on to cooking I harvest a bunch and made into this egg drop soup, it taste almost like spinach, only better. 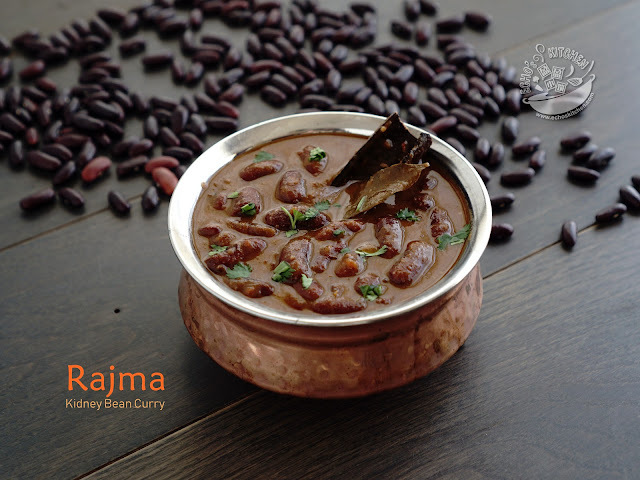 Chili leaves contains complete range of amino acid almost 4 times compared to the chili fruits. It also contains more than double what chili fruits have of which are anti-cancerous substance. On top of that, chili leaves are rich in calcium, beta carotene, various vitamins and other nutrients. Eating a suitable quantity of chili leaves enhances secretion of digestive juices, improves appetite and is good for indigestions, gastric and stomach discomfort. Regular intake of chili leaves also help in warming body, strengthen liver, improve eyesight, reduce weight and improve beauty. 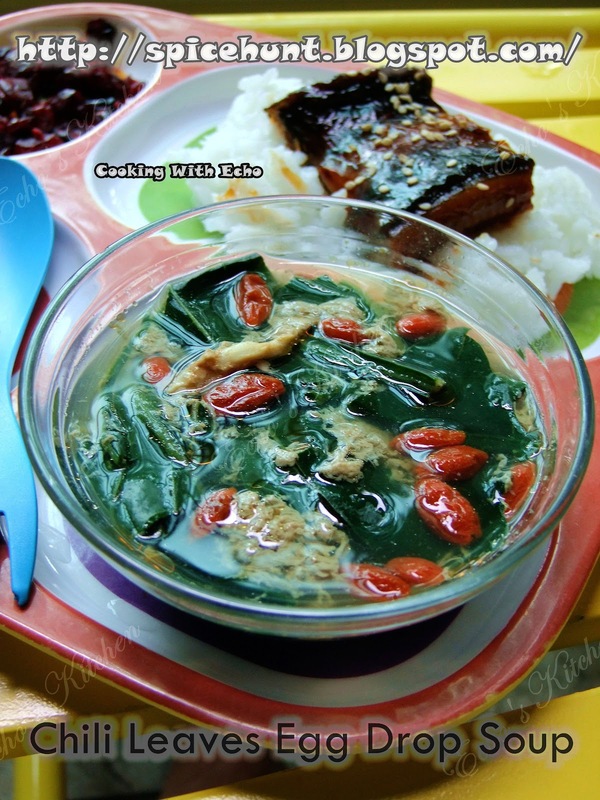 Chili leaves is tasty and can either be cooked alone, frying with meat or making soup. 1. 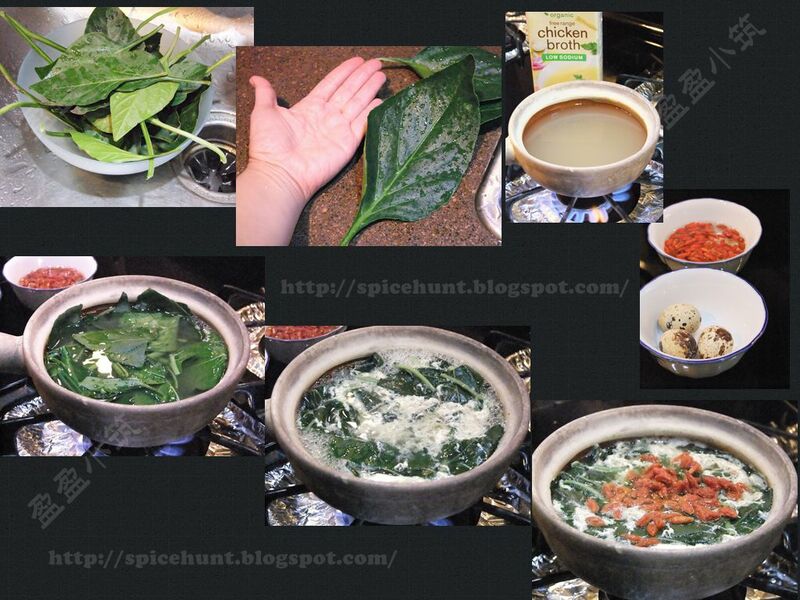 Cleaned the chili leaves and breaks into small pieces by hand or cut using knife. 2. Bring the stock to boil on stove, add chili leaves, boil for another 2-3 minutes. 3. Lightly beat the egg with a pinch of salt and a little pepper powder, stir the boiling soup into circular motion, slowly drop the egg into soup and the egg drop will form naturally this way. 4. Switch off stove and add the washed goji berries and sesame oil, season with a little salt if needed. Nutritious and tasty, for those who has pepper plant at home, don't just wait for pepper, eat the leaves too! Yes you can use basically any type of pepper/chili leaves, they tasted all the same.